Lace in Translation is a ground-breaking exhibition of contemporary work that redefines historic lace and explores the intersection of luxurious hand-craftsmanship with modern, mass production. The Design Center at Philadelphia University’s historic Quaker Lace Company collection is the inspiration for three internationally-renowned artists and designers reconsidering conventional notions of lace. 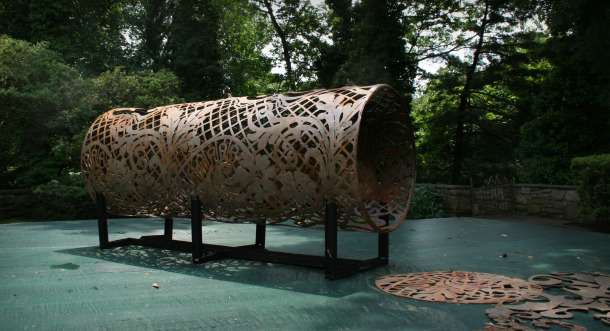 European designers Tord Boontje and Demakersvan, and Canadian artist Cal Lane have created installations specifically for TDC’s unique and intimate space — a 1950s era, Hollywood-style ranch house, one of the first in Philadelphia, and situated on the edge of Fairmount Park. From the intricacy of a handwoven raffia curtain, to the industrial art forms of laser-cut fabrics, a welded filigree oil tank, and a lace chain-link fence, Lace in Translation plays with the concept of lace, utilizing unexpected materials and new technologies to transform the Center’s grounds and galleries. A special exhibition website is available at www.laceinstranslation.com which invites visitors to preview the exhibition and to submit their own designs and handwork. The exhibition has drawn several thousand visitors and groups from all over the U.S. The Design Center has hosted tours for the Los Angeles County Museum of Art, Maryland Institute College of Art, the Costume Society of America, the Embroiderers Guild of America, the Textile Museum of Washington, D.C., St. Andrews College of Grahamstown, South Africa, University of Delaware, West Virginia University, and the Philadelphia Public Arts Forum, among many others. For this pioneering exhibition, The Design Center has created a 102-page richly illustrated exhibition catalog, featuring essays written by Matilda McQuaid and Nancy E. Packer. An exceptional reference for all those interested in design, art, and industrial history, the catalog is filled with full-color reproductions and photographs of intriguing source materials — elegant drawings, machine-made lace samples, and savvy marketing materials — that served as touchstones of inspiration for the commissioned artists and designers. The catalog also features in-depth artist interviews, curator commentary, a DVD video insert, and more. The catalog is now available for purchase in person at The Design Center through the University of Washington Press website, or by calling the University of Washington Press fulfillment agency at 1-800-537-5487. As part of the nation’s oldest textile school, The Design Center’s historic textile collection features many artifacts from Philadelphia’s pinnacle as a national center for textile design and manufacturing. The Center’s lace collection includes some 150 machine-made lace samples and marketing materials from the Quaker Lace Company of Philadelphia. TDC also houses an extraordinary collection of hundreds of original design sketches by Quaker Lace designer Frederick Charles Vessey (1862-1948). Just as the Lace in Translation designers and artist turned to these historic designs for inspiration, Vessey himself mined such varied sources as Egyptian tomb paintings, Jacobean architectural motifs, and tin ceiling catalogs to inspire and inform his designs for the Quaker Lace product line. PHILADELPHIA – Visitors to The Design Center at Philadelphia University have just weeks left to see Lace in Translation, the ground-breaking exhibition of contemporary work that redefines historic lace, before it closes on April 3, 2010. Frill'er Up; "Lace in Translation" sews detail and delicacy into utilitarian design. For “Lace in Translation,” The Design Center invited three internationally renowned artists and designers to rethink the idea of lace, resulting in radical and whimsical takes on a form which typically refuses to descend from its lofty, elegant perch. Laced out! Fashion's new fabric obsession; Lace brings a chic edge to fashion, art and design. “Today, lace is in free fall, finding its way into every conceivable form, from side tables and chairs to lighting and buildings.” Jay and Bednar are part of a trio of curators at work on Lace in Translation, an exhibition produced by The Design Center at Philadelphia University that opens next year. The exhibition will showcase artworks and installations inspired by The Design Center’s lace archives but transposed into distinctly unexpected media, like old, rusted wheelbarrows and chain-link fences.